Sotomayor's Diabetes: Will It Be a Handicap? As President Obama's first nominee to the Supreme Court, Judge Sonia Sotomayor approaches the bench with a number of firsts. If she is confirmed to the lifelong post, as is widely expected, Sotomayor would be the first Hispanic to sit on the high court, and she would also be the first Justice with Type 1 diabetes. Still, while better medications have helped reduce deaths due to heart disease among Type 1 and Type 2 diabetes patients, that trend has been seen only among men. Between 1971 and 2000, heart-related deaths among men with diabetes dropped by half but doubled among diabetic women in the same time period, according to a 2007 study. Many diabetes patients also suffer from poor circulation, which puts them at higher risk of vision problems and amputation when blood does not adequately nourish tissues. Without enough naturally produced insulin, Type 1 diabetes patients must rely on an artificial source; some patients wear insulin pumps, which are permanently inserted under the skin to deliver a dose of the hormone after each meal or snack, while others self-administer regular insulin injections to sustain normal levels throughout the day. The proper management of blood-sugar levels, say experts, can keep many diabetes-related complications at bay. 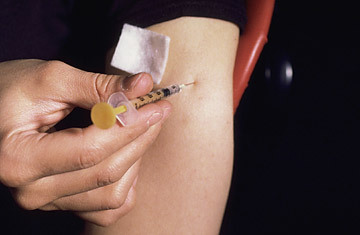 Today, patients can choose from among 20 highly effective types of insulin, some man-made and some derived from animals. One synthetic product called pramlintide, which was recently approved by the FDA, appears to control blood-sugar levels more naturally, without the huge dips in glucose that can occur when the body receives too much insulin at one time. The more successful a patient is at maintaining consistently normal blood-sugar levels, the more likely she will be able to avoid damage to the heart, kidney or other organs. "In the days leading up to this nomination, there were several media reports suggesting that Judge Sotomayor should not be considered for this position simply because she has Type 1 diabetes," said Dr. R. Paul Robertson, president of the American Diabetes Association, in a statement following Sotomayor's nomination. "The advancements in the management of Type 1 diabetes have been just amazing over the last two decades, and the ability of people to manage their diabetes successfully has been proven. People with diabetes can function and live a long and healthy life."